Bruichladdich’s Black Art series has always been one of the most enigmatic range of whiskies of any Scottish whisky distillery, but even for the self-styled ‘Progressive Hebridean Distillers’ and ‘bad boys’ of the industry the whiskies of this range are decidedly non-conformist. In fact when Bruichladdich‘s former master distiller, the legendary Jim McEwan created the first Black Art back in 2009 he threw aside all traditions and preconceptions and essentially plundered stand-out casks that the Islay distillery had meticulously hoarded over the years. 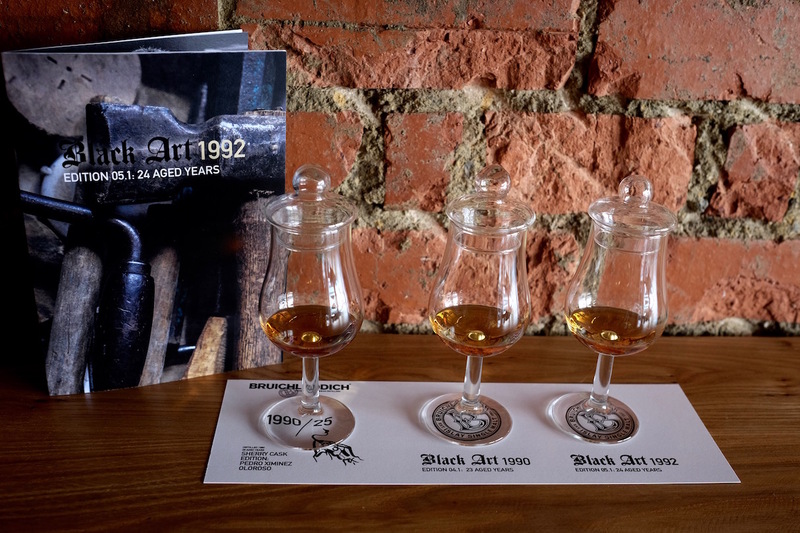 The Black Art 5 differs from its predecessors because Jim McEwan retired in 2015, and new head distiller Adam Hannett took over to carry on not only McEwan’s legacy but also the responsibility of continuing the Black Art. But it wasn’t to be. It’s somewhat of a surprise because McEwan had been a mentor to the younger Hannett for the longest time. Islay-born Hannett had spent part of his teens welcoming visitors to the Bruichladdich distillery, and McEwan had early on recognised Hannett’s incredible palate and nose for whiskies, and had taken him under his wing until he could pass the mantle over. Then again you can consider Hannett’s act of ignoring McEwan’s instructions not so much as disrespect but being totally in line with Bruichladdich’s very same willful disregard for tradition and the same spirit that embodies the Black Art. So what is Hannett’s Bruichladdich Black Art 5, the fifth in that limited edition series? It’s a 1992 vintage, bottled at a cask strength of 48.4%. You won’t find out much more; unlike its core range Bruichladdich does not have the habit of revealing what goes into the Black Art series. But you can expect the liquid to exude lavish fruit notes in cherry, mango, apricot and orange citrus. The whisky also evolves in the glass; tropical and stone fruit notes follow, along with hints of pipe smoke and sweet wood spice. Only 12,000 bottles of the Bruichladdich Black Art 5 have been produced. You can get a taste of it at The Wall (76 Tanjong Pagar Road, Singapore 088497) and La Maison du Whisky (80 Mohamed Sultan Rd, #01-10 The Pier, Singapore 239013). You can also purchase a bottle at La Maison du Whisky for $495.